In a rather unfortunate start to his first attempt at the Dakar Rally, TVS Sherco Racing's Aravind KP has now dropped out of the race due to an injury. Despite fracturing his hand during Stage 1, Aravind continued to race in the next stage where he finished 127th. However, after he injured his shoulder in a crash during Stage 3, he was forced drop out of the rally. 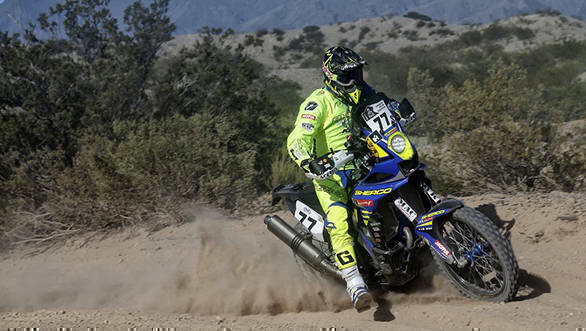 Meanwhile his team-mate, Juan Pedrero Garcia, managed to complete the stage in 16th place despite losing around 15 minutes when he lost his way. He finished Stage 3 in 4hr57m37s, which is 33m56s behind the stage leader, Joan Barreda Bort. Garcia currently stands 14th in the overall standings. Adrien Metge had a fairly successful run in Day 3 too after he finished 30th in the stage with a time of 5hr23m31s. This pushed him up from 124th to 65th in the overall Bike category.